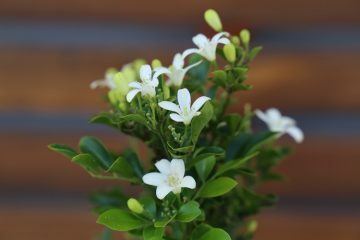 Murraya is a member of the citrus family and the resemblance can easily be seen in its sweet smelling flowers, delicate white flowers, and glossy dark green leaves. 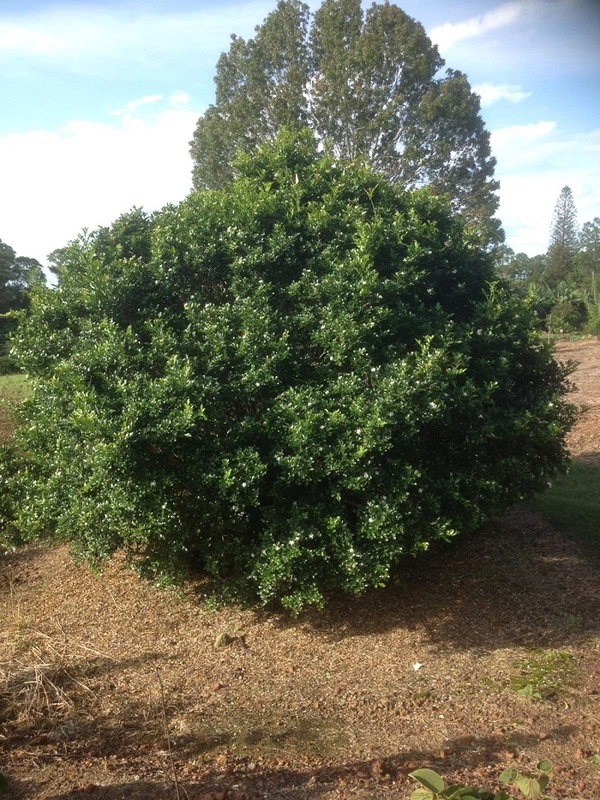 Murraya is ideal for privacy hedging and shelter plantings thanks to its dense growth habit. The deeply vibrant colour of the leaves is attractive in its own right but the unmistakable perfume of orange blossom is the icing on the cake. Murraya works beautifully as a specimen shrub too. Murraya is also known variously as; Mock orange, Chinese box, Cosmetic bark tree, Honey bush or Jasmine orange. But the name Murraya refers to the 18th century Swedish botanist, Dr. Johann Murray. You should choose a Murraya hybrid cultivar because the original Murraya paniculata is now classed as an invasive weed by many local authorities throughout NSW and Queensland. Coming from Asia, Murraya panniculata thrives in Australia’s hot climate and can quickly out compete native plants. The invasive nature of Murraya paniculata is in many ways just too much of a good thing. After all it’s that rapid growth that makes it so suitable as a hedge or screen. Fortunately, you can take advantage of the available Murraya cultivars such as Ozbreed’s ‘Sweet Privacy Murraya’. The name—Sweet privacy– says it all. The range of Murraya cultivars means there is a variety that’s perfect for your privacy hedge, windbreak or specimen plant. The rapidly growing foliage forms a dense impenetrable hedge that’s ideal for shutting out the prying eyes of neighbours or creating a more sheltered environment for more vulnerable plants. Some Murraya varieties can grow up to a 3m high small tree so it’s really up to you how you want your hedge to look. If you only want a shoulder height border hedge or a small specimen shrub you would be better choosing a variety that doesn’t grow too tall. Murraya is generally a hot climate plant but there are some frost tolerant varieties available too. Some varieties will produce bright orange oval-shaped fruits, which the birds love. Sweet Privacy™ Murraya’. The name says it all. Ozbreed know that special things take time and we’ve been working on a special Murraya variety for a while now. And Sweet Privacy Murraya is definitely well worth the wait. Ozbreed wanted to retain all the beautiful Murraya characteristics: sweet smelling white flowers, good hardy growth and dense foliage. Sweet Privacy is perfect for shoulder or head height hedging. It grows up to 1.5 to2.5m high x 1.5m wide. Its dense growth habit will not only make your backyard more private but it will also deaden some of the noise from neighbouring properties or the road. Consider planting Sweet Privacy along the front of your property so that you can reclaim your front yard too. But many gardeners find that the rapid growth rates mean their Murraya can quickly look untidy and lose that dense hedge form. Fortunately, Sweet Privacy needs less pruning than many other cultivars—just a light prune twice a year. If you really want to make your hedge particularly tight and dense then a third pruning annually may be needed. Sweet Privacy just keeps on producing those exquisite little flowers from spring through to early autumn. The beautifully fragrant white blossoms contrast nicely against the glossy green leaves allowing you to create your own perfectly private little paradise. Plant in full sun to part shade and Sweet Privacy will live up to its name with very little maintenance. Sweet Privacy Murraya grows well in Queensland, Northern Territories, Western Australia, NSW, Victoria, and South Australia. Murraya are tough but if you want them to perform at their best it’s worthwhile taking a little care during both the planting and growing stages. Murraya is a hot climate plant and so does prefer full sun but part shade is o.k. too. The ideal Murraya hedge spacing is between 50 and 80 cm apart. With bigger varieties you can space the plants up to 1m apart. It’s worth giving your plants a little more space if the site a little shady. The extra space will encourage air movement and inhibit the growth of moulds and fungal diseases. Murraya have very moderate watering requirements once they’re established. Murraya are generally happy in a wide range of soil types but good drainage is critical. Good soil structure rich in nutrients will keep your Murraya hedge looking its best. Like other citrus trees soil deficiencies may show up in a yellowing of the leaves. It’s important to improve the soil and regular mulching with chunky mulch is a good way to prevent nutrient deficiencies spoiling your Murraya’s good looks. Don’t pile the mulch up directly around the stem as this may promote fungal diseases. Fertilise at least once a year with a high quality slow release fertiliser. Water only as needed and don’t let Murraya stand with wet feet. The problem is that over-watered plants may appear to exhibit the same symptoms as dry, thirsty plants. If the soil is moist then the issue is unlikely to be lack of water. Regular light pruning is one regular maintenance task that you will want to do to keep your Murraya hedge looking its best. It’s the rapid growing nature that makes Murraya ideal for privacy hedges but if you don’t keep a check they can quickly get out of hand. Ozbreed’s Sweet Privacy has been bred as a low maintenance plant but even so it will still need light pruning twice a year. In general terms most Murraya don’t need to be cut back too harshly – regular light pruning is the better way to go. Prune the top growth so that you can maintain your desired hedge height. But avoid cutting away too much along the hedge sides as this will remove the flower buds. This is especially true during the flower season. A light prune at the end of autumn after flowering has finished will encourage more prolific flowering the following spring. 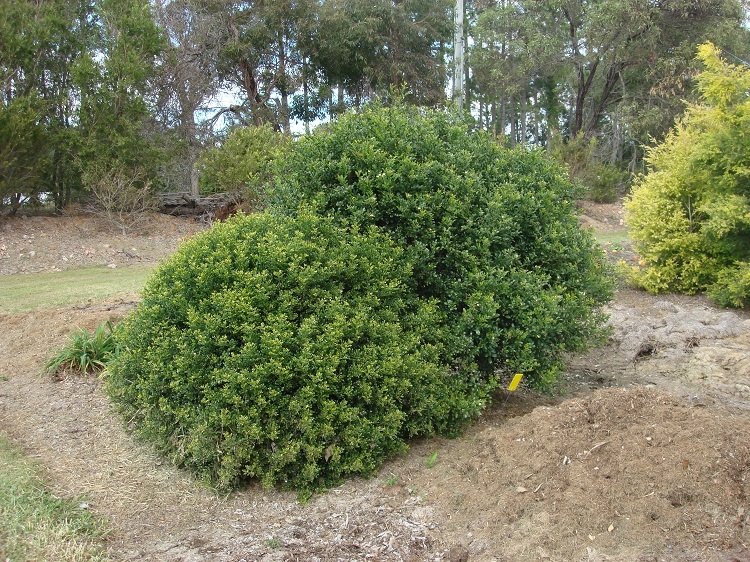 Murraya may not make the best choice for a strictly shaped formal box hedge because the lateral pruning will remove one of its most attractive features: its flowers. But if you can live with a slightly less well-defined hedge you will get the best of both worlds. Without regular pruning Murraya can quickly start to look wild and untidy and gaps may appear. The good news is that Murraya will respond to a deep cutback with vigorous new growth. Too much moisture is one of the biggest issues for Murraya. Too much water in the soil severely inhibits oxygen uptake in the roots and can eventually lead to the death of your plants. Leaves turning yellow and dropping off may be a sign of overwatering. Too much water may also lead to root and crown rot. If the water does not drain away the plants will eventually die. Stop watering and allow the root system to dry out. If this occurs regularly you may need to sort out the drainage problem. Fungicides may be beneficial for root or crown rot problems in the short-term. Yellow leaves may also indicate nutrition deficiencies, in particular, a lack of either sulphur or nitrogen. Applying some sulphate of ammonia will address both nitrogen and sulphur imbalances. Good mulch is very effective in solving both these problems long-term. Murraya are also prone to a recent pest arrival—a borer beetle that eats its way through the centre of stems and eats the outer bark. Murraya paniculata originally came from South East Asia but it has become naturalised in Australia and is now considered an invasive pest in some parts. It is in the list of the top 200 most invasive weeds in south-eastern Queensland for example. The invasive Murraya may also produce allergy reactions such as blocked sinuses, headaches, and breathing problems in some people. Source Murraya plants carefully – avoid plants grown from seed. This is because they may not be consistent or true to type and they may also add to Australia’s weed problem. There is also a version of Murraya (Murraya ovatifoliolata) that is native to northern Australia—it is distinguished by its smaller leaves and is slower growing. However, you can also obtain many cultivars of the Murraya paniculata including Murraya paniculata dwarf forms that are safe for home garden use. Solid hedging for privacy, wind protection or as a beautiful specimen shrub, Murraya makes a delightfully fragrant addition to any garden. For Harsh Hot, Dry and Wind Swept Positions. Minimalist or more Traditional? Modern Australian formal gardens reflect our culture. What are the best small to medium size hedging plants to use in Australia? This tough drought and frost tolerant Westringia looks great when pruned to shape or left in its natural ball shape. 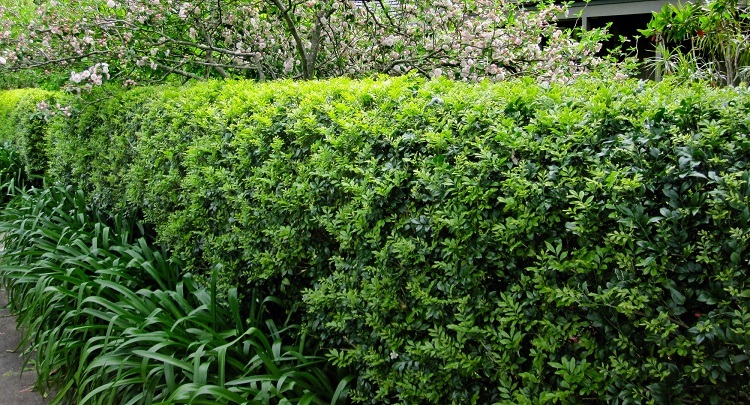 Take a look at the top 10 screening hedges and plants.